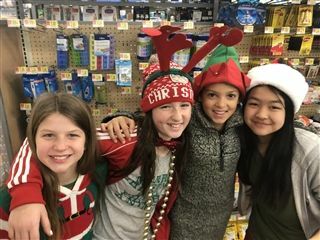 In December, while others were busy enjoying Christmas parties and the hustle and bustle of the season, fifth and sixth grade students at the Birdwood Campus were participating in a service project that was focused on blessing others in need for the holidays. The project was started by Mrs. Morgan, a former history teacher, who shared about her brother’s ministry to homeless men. The project was led by fifth and sixth grade students, who shared their desire to help the homeless with the entire Lower School. Each class in the school was invited to collect change. The fifth and sixth graders also baked for and hosted two bake “sales” where they asked for free-will offerings. The proceeds from the bake sales and the change collection totaled almost $1500! The students then took the proceeds and went shopping at Walmart in groups a few days before Christmas. According to teachers, the students loved shopping for the men and they learned about budgeting and tax along the way. They bought items like toiletries, snacks, hats, and gloves. After the shopping trip, they returned to school and stuffed the supplies they had bought into socks to make “stockings”. They filled 80 pairs of socks with the items and made cards with verses and encouraging notes. After filling the “stockings”, students distributed them to men staying at the First Presbyterian Church as a part of PACEM (People and Congregations Engaged in Ministry). PACEM is an organization that partners with community groups and congregations to provide shelter in the winter to the homeless in Charlottesville. Students thoroughly enjoyed the opportunity to serve others during the Christmas season and they learned a lot along the way. You can learn more about PACEM and the amazing work they do by visiting their website.